A strong contender for the best book I’ve written: funny, passionate, free-wheelingly anecdotal, charmingly conversational, witty, wise and oh so very true. Ostensibly it’s about the worrying similarities between snake-oil-salesman Tony Blair and his Mk II version in the US presidency Barack Hussein Obama. Really though, it’s about much more than that: this may well be the most brilliant apologia for conservatism since P. J. O’Rourke’s Republican Party Reptile. Yeah, I know: immodest but I just can’t help it. 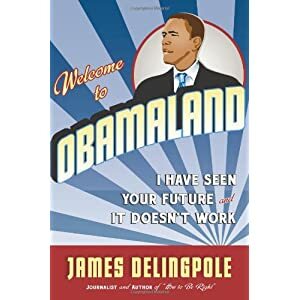 Seriously, when I read Obamaland I feel it’s just too good for me to have written it. It flows so well. (I wrote it very fast, so maybe that helped). It warns of the perils of free universal healthcare; the bunny-huggers who seek to stop us enjoying our inalienable rights to go hunting (either on horseback or with guns); the stupidity of left-liberals (whose frontal lobes have not properly formed); the ruination of our culture through relativism and progressive education; the deceit, lies–-and lunatic expense to the taxpayer-–of the Anthropogenic Global Warming industry. You will like it if: you are a true Conservative; you are intelligent; you have a sense of humour.